Want to ensure solid protection of your kitchen counters from getting damaged by the heat from hot cookware? You will need our top quality trivets / pot holders for it. Available in small, medium and large sizes, these trivets and pot holders are great for use on dining room tables and other delicate surfaces. They are made from select materials and are procured only from the established brands of the market, so that you can deal with us with full confidence in our products. Our magnetic trivets are the unique offerings, which are designed for use cast iron and stainless steel pots. By getting themselves attached to the bottom of the cookware, these trivets make it easier for you to transfer the hot cookware from kitchen to the dining table. 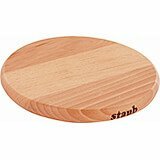 11.3" X 7.7" X 0.79"
This is Staub's largest oval magnetic trivet. The 11 3/8" wooden trivet has an internal magnet and can be used for a wide array of cast iron and stainless steel pots. The magnet is hidden inside the trivet to retain its aesthetic beauty while protecting your counters and tabletops. The trivet attaches to the bottom of the cookware allowing you easier transport of the cookware from the stove to the table. 11.75" X 11.75" X .75"
This is Staub's largest magnetic trivet. The 9” wooden trivet has the strongest magnet and can be used for a wide array of cast iron and stainless steel pots. The magnet is hidden inside the trivet to retain its aesthetic beauty while protecting your counters and tabletops. The trivet attaches to the bottom of the cookware allowing you easier transport of the cookware from the stove to the table. 6.75" X 6.75" X .75"
This is Staub's smallest round magnetic trivet. The 6" wooden trivet has an internal magnet and can be used for a wide array of cast iron and stainless steel pots. The magnet is hidden inside the trivet to retain its aesthetic beauty while protecting your counters and tabletops. The trivet attaches to the bottom of the cookware allowing you easier transport of the cookware from the stove to the table. 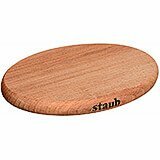 8.2" X 6" X 0.75"
This is Staub's mid-size oval magnetic trivet. The 8. 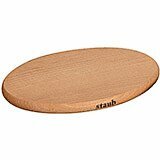 25" wooden trivet has an internal magnet and can be used for a wide array of cast iron and stainless steel pots. The magnet is hidden inside the trivet to retain its aesthetic beauty while protecting your counters and tabletops. The trivet attaches to the bottom of the cookware allowing you easier transport of the cookware from the stove to the table. 6" X 4.4" X 0.75"
This is Staub's smallest oval magnetic trivet. The 6" wooden trivet has an internal magnet and can be used for a wide array of cast iron and stainless steel pots. The magnet is hidden inside the trivet to retain its aesthetic beauty while protecting your counters and tabletops. The trivet attaches to the bottom of the cookware allowing you easier transport of the cookware from the stove to the table.